Jennifer Kishimori holds two rescued kittens known as "The Waipahu Twins" in her garage, which serves as a rescue medical ward at her home in Aina Haina. Vets working with her group sterilize about 90 cats per month. 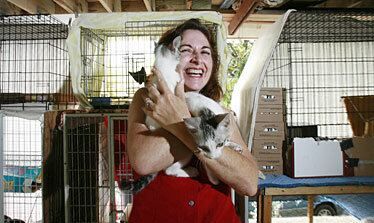 Jennifer Kishimori's grin grows as she removes a cat from its cage, holding it aloft. "This is the success story of 2007," she proclaims. Its name is Mickey, for the Salt Lake-area McDonald's where he was found. Once stick-thin and near death, the now-round cat has improved under Kishimori's care; in two more weeks the rescuer who found Mickey will take him home. Kishimori refers to Mickey as her "$500 cat," for the amount it cost to remove his infected eyes. Mickey requires medication and extra attention, which he gets from Kishimori. He is just one of the abandoned or feral felines Kishimori monitors as a founding member of CatFriends, a nonprofit organization committed to trapping and neutering cats in an attempt to humanely control Oahu's feral cat population. This year the organization fostered 200 cats, its expenses paid out of pocket or through donations. While some cats are pulled as potential adoptees -- younger or extremely sociable cats have the best chances at being adopted, Kishimori said -- others are released back at the location where they were found. It is their next best chance for survival. Kishimori has adopted some of the cats least likely to find a home or to survive on their own; some cats were deemed "unadoptable" by area shelters. Kishimori works with caretakers who monitor more than 100 cat colonies, ranging in size from three cats to 50. "I wouldn't know what I do without the volunteers," Kishimori said. "It's so important to manage (the colonies), because you'll just get the colony under control and then some are added, and boom." She routinely traps cats on her own at night, administering medication and implanting microchip identification, then coordinating neutering with volunteering veterinarians. Sometimes dogs are found, too. "I can count the number of hours I sleep on one hand," she said. "I'll sleep when I die. I just want to make a difference. I'll retire when there isn't a need for trapping and sterilizing." CatFriends is not a shelter, yet Kishimori receives about 10 calls a day, sometimes from people asking for help finding their cats new homes. While the animal lover is particularly pleased to discuss hindrances such as transportation issues, pet-related disputes between neighbors or the cost of sterilization and microchipping with callers, outright abandonment of animals rankles her. "The colonies get out of control as cats are being dumped off," she said. "They are kept out by the other cats and are fighting for food. I can't stand seeing friendly cats among the wild ones. ... They're in the rain, no shelter, and then they just get sick and the (owners) just don't care. ... And I don't believe in euthanasia."